Organizations are adopting source code analysis technology as a standard part of their integration build during pre-quality assurance activities. Despite the benefits of source code technology, build-time analysis continues to suffer from an inherent weakness: code has already been committed to a source branch. Thus, by the time a bug is discovered it is already impacting other members of the development organization and other elements of the system. 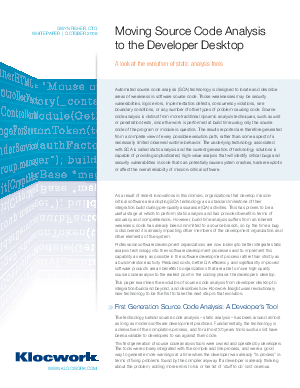 This white paper examines how the next generation of source code analysis tools are moving high-quality source code analysis to the developer’s desktop and performing it at the earliest point in the development cycle - before code check-in. Learn why the developer must be an integral part of the process of identifying, fixing and preventing bugs from reaching the code stream. Explore why wholly centralized source code analysis is disenfranchising to developers and can create cultural barriers that will adversely affect software development. Learn how you can enhance your code management and quality by combining the speed and productivity benefits of desktop source code analysis with the power and accuracy of system-wide analysis.